Halloween might just go too fast in this deluxe Flash costume for adults. 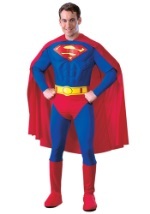 The classic superhero costume includes a red jumpsuit that is embellished with the Flash logo on the muscle chest and lighting bolts around the wrists and waist. Yellow boot tops are attached at the jumpsuit's bottom and a Flash headpiece completes this look. The headpiece covers the upper portion of the face with slits for the eyes and lighting bolts fastened on the sides. Become faster than the speed of light in this fantastic costume.